Improved access to high-quality diagnostic screenings for potentially undiagnosed conditions could result in serious health concerns being caught earlier, when they’re most treatable. For example, FOX 13 News in Tampa recently reported the story of a 55-year-old local woman who is urging other smokers to get a CT lung cancer screening after an impromptu scan possibly saved her life. According to the report, Kathy Swan’s physician ordered a CT scan because she was a smoker. 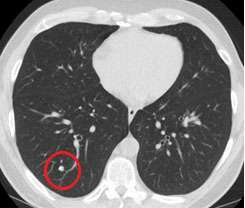 Although her x-ray was unremarkable, the CT revealed two lung nodules. Because the cancerous growths were found early, doctors were able to remove the nodules quickly and without radiation or chemotherapy. If you are a current or former smoker, your risk of developing lung cancer may be up to 25 times higher than someone who never smoked. Lake Medical Imaging performs low-dose CT screenings for lung cancer, with a doctors’ order, on a cash pay basis for $99 for those with no symptoms. Lake Medical Imaging is fully accredited by the American College of Radiology (the gold standard of imaging), and was the first outpatient center in Florida to be named an ACR Diagnostic Imaging Center of Excellence.